Alyssa regresses her big sister Kim and steals her boyfriend! Kim’s little sister Alyssa is a witch! This comic has LOTS of process sequences including Age Regression, Age Progression, Breast Enlargement and even Male AR! 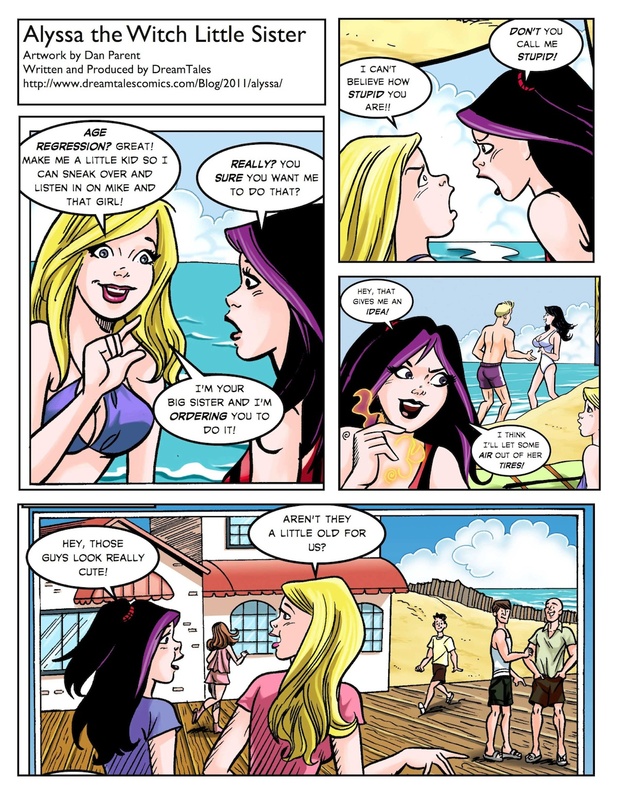 The art is by Dan Parent, nationally known for his work on Archie Comics. Story Summary: Kim’s world turns upside down when she discovers that her younger sister is a witch! But Alyssa has only gotten to the letter “C” in her book of witch’s spells, so she can only do a few spells like Age Regression and Breast Expansion. Sparks soon fly between Alyssa and her older sister – who doesn’t look older any more. This comic is also part of the Alyssa the Witch Little Sister Pack. This entry was posted in Age Progression, Age Regression, All Comics, Dan Parent, Male AR, Rated PG and tagged Age Progression, Age Regression on March 24, 2011 by dreamtales. Decent, but not much content for the $8 price tag. Also I get the sensitivity with the AG part but a dash of hot-sauce with AP, BE would get me to purchase issue #2. Great work~…. and much welcomed new artist! I try to keep costs down, but I can’t afford to take a big loss on these comics. This comic was really expensive to produce – Dan Parent charges double per page what Palcomix does, so this is equivalent to a 40+ page comic in total cost. I think Dan did a great job, but I’ll have to see how sales go to determine if it was worth it, economically. Holy cats! Dan Parent! Way to go, DreamTales! Hi Joe, good to hear from you! Yes, for an old Archie fan this really was a dream come true. how young does Kim get? She turns into a 6 year old.